You are viewing the documentation for the 2.0.x release series. The latest stable release series is 2.7.x. Working with Play is easy. You don’t even need a sophisticated IDE, because Play compiles and refreshes the modifications you make to your source files automatically, so you can easily work using a simple text editor. However, using a modern Java or Scala IDE provides cool productivity features like auto-completion, on-the-fly compilation, assisted refactoring and debugging. You then need to import the application into your Workspace with the File/Import/General/Existing project… menu (compile your project first). You can also start your application with play debug run and then you can use the Connect JPDA launcher using Debug As to start a debugging session at any time. Stopping the debugging session will not stop the server. Tip: You can run your application using ~run to enable direct compilation on file change. This way scala templates files are auto discovered when you create new template in view and auto compiled when file change. If you use normal run then you have to hit Refresh on you browser each time. If you make any important changes to your application, such as changing the classpath, use eclipse again to regenerate the configuration files. Tip: Do not commit Eclipse configuration files when you work in a team! 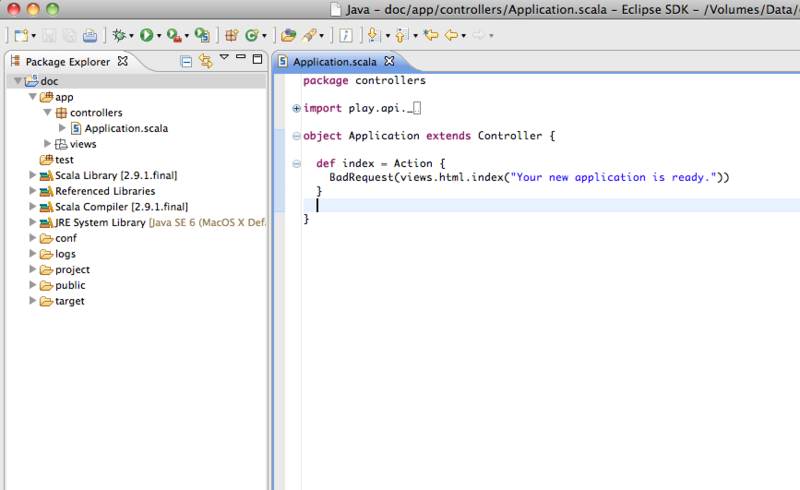 Tip: There is an Intellij IDEA issue regarding building Java based Play2 apps while having the Scala plugin installed. Until it’s fixed, the recommended workaround is to disable the Scala plugin. Set some breakpoints. Run the web app by executing the task play (again I had to do this in same terminal I ran play debug). Finally, browse http://localhost:9000. IntelliJ should stop at your breakpoint. If you make any important changes to your application, such as changing the classpath, use idea again to regenerate the configuration files. Play does not have native Netbeans project generation support at this time. 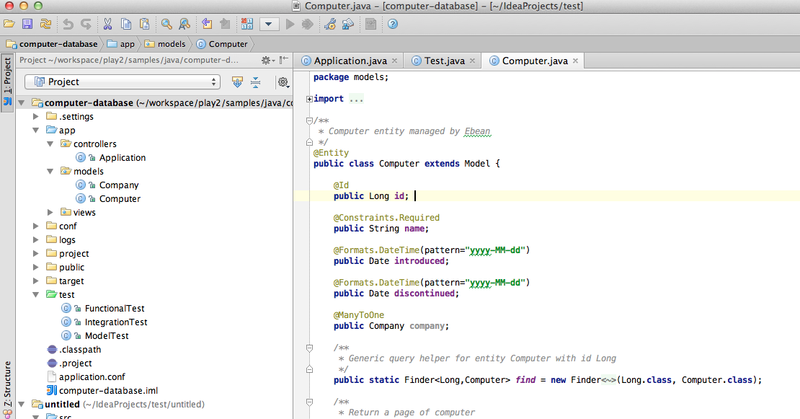 For now you can generate a Netbeans Scala project with the Netbeans SBT plugin. "org.netbeans" %% "sbt-netbeans-plugin" % "0.1.4"